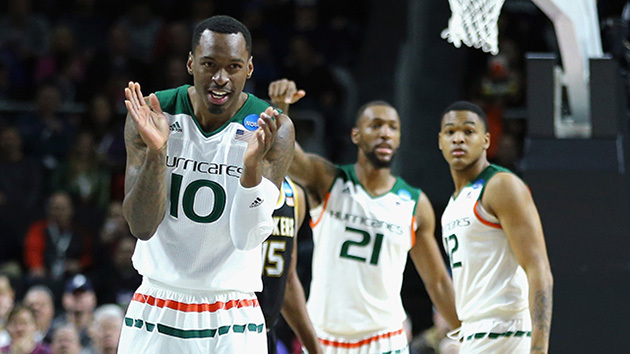 Everything you need to know about the Miami (Fla.) Hurricanes as they head into the Sweet 16. The Case For:: Miami took down No. 14 Buffalo and No. 11 Wichita State to get to the Sweet 16, though they weren’t exactly spotless in either performance. What was impressive, however, was the way they punched back after letting a huge second-half lead over the Shockers slip away. That speaks to the veteran leadership on this team from McClellan, Angel Rodriguez and Tonye Jekiri. That Miami is in the Sweet 16 without playing its best could be a good thing. They’ll obviously need to play better to get past Villanova and potentially the Kansas/Maryland winner, but their ability to win without their fastball suggests they’re the kind of team that knows how to find a way, a mentality that comes from coach Jim Larrañaga​ at the top and trickles down to all of his players. The Hurricanes have arguably the toughest road to the Final Four of any team remaining in the Sweet 16, but we saw them string together the sort of win streak they’ll need to get to Houston already this year. It was just over the last two weeks of the regular season that they beat Virginia, Louisville and Notre Dame in succession. Another such run will have them cutting down the nets in, appropriately enough, Louisville. The Case Against: Well, it starts with the teams standing in Miami’s way. If they are going to get to the first Final Four in program history, they’ll have to go through Villanova and likely Kansas, two teams that have been at or near the top of the national rankings all season. Even if they beat Villanova and catch a break with Kansas losing on the other side of the region, beating Maryland to get to the Final Four won’t be easy. The Wildcats are basically a mirror image of the Hurricanes. Both teams are packed with upperclassmen, though Villanova leans heavily on freshman guard Jalen Brunson as well. They play at a relatively slow pace, shoot the three-ball decently, and are excellent inside the arc, as well as at the free throw line. If the antidote for Miami is matching exactly what it wants to do, Villanova definitely has the formula. As good as the Hurricanes are on offense, they can get into some ugly stretches where they struggles to put up points. They were able to get away with that against Wichita State, but that won’t be the case against any of their potential opponents remaining in the South region. Did we mention they’ll likely have to beat Kansas to get to the Final Four? We did? O.K., good.